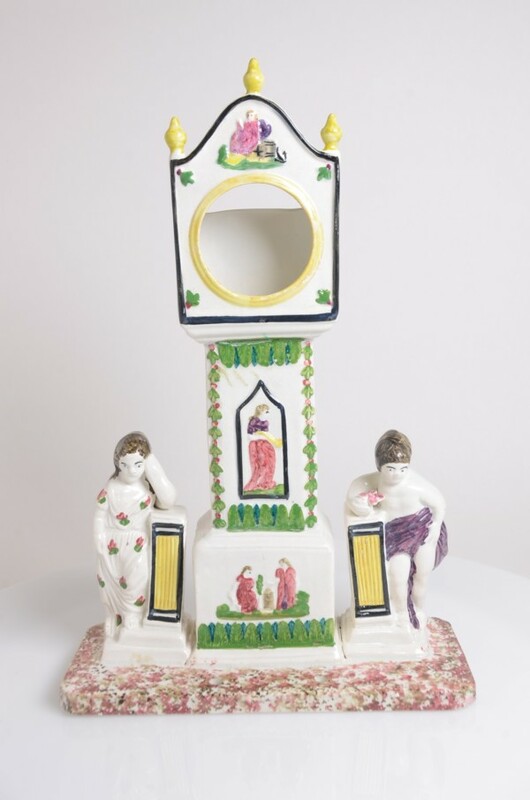 An underglaze coloured watch stand in the form of a long case clock, decorated in relief with small groups of classical figures, coloured in yellow, puce, red, green and blue. The central figure is framed in a border of stiff leaves painted in shades of green an red. The tall clock is flanked by the figures of children wearing red drapery. 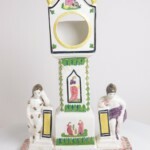 The figures each side of the clock lean on raised pedestals. The flat rectangular base plate is sponged in red and brown. Interestingly there are two pierced holes from manufacture to the front of the base, it is thought that their intention was to enable the piece to be fixed with screws to the top of a mantle shelf.